The health of its placekicker is only occasionally a concern for a NFL team. On September 25, 2005 it became a major issue for the Philadelphia Eagles in their game against the Oakland Raiders. David Akers (pictured above) had been an outstanding placekicker for the Eagles since joining the club in 1999, first just handling kickoffs and long field goal attempts, and in 2000 taking the job over completely. From that time through the 2004 season, he had booted 139 field goals to make him the franchise’s career leader in that category and his 83.2 percent success rate put him among the all-time leaders in NFL history up to that point. The left-footed Akers had been selected to the Pro Bowl on three occasions. Coming into the Week 3 contest against the Raiders, however, the star placekicker was having hamstring problems and the Eagles had taken the precaution of signing PK Todd France to the practice squad. They did not activate him, however, when Akers appeared to be healthy during pre-game warmups. The Eagles, NFC Champions in 2004 and 1-1 thus far in ’05, had players other than Akers battling injuries. Most significantly, star QB Donovan McNabb was suffering from chest and groin injuries. And while there had been off-field controversies in the offseason, Philadelphia, under seventh-year Head Coach Andy Reid, still had a fundamentally sound team that included RB Brian Westbrook and flamboyant WR Terrell Owens on offense and a tough defense anchored by MLB Jeremiah Trotter and FS Brian Dawkins. As for the visiting Raiders, coached by Norv Turner for the second year, they were coming off of two straight losing seasons – including a 5-11 record in ’04 – after having been AFC Champions in 2002. Their major offseason moves were to acquire talented but controversial WR Randy Moss and RB LaMont Jordan, as well as pass-rushing DE Derrick Burgess, who was signed away from the Eagles. Still, they were 0-2 after two weeks of play. There were 67,735 fans in attendance at Philadelphia’s Lincoln Financial Field, and what they saw initially was not promising. The Eagles kicked off to start the game, and upon booting the ball Akers crumpled to the ground in obvious pain. Philadelphia was flagged for being offside and Akers had to kick off again, with the same result – including an offside penalty on the Eagles. After the placekicker was helped to the sideline, backup TE and long snapper Mike Bartrum finally got off a successful kickoff, but it was short and, following a 21-yard return by CB Chris Carr the Raiders had outstanding field position at the 50 yard line. It didn’t take long for Oakland to make the most of it. In four plays, most notably a 36-yard pass completion from QB Kerry Collins to TE Courtney Anderson, the Raiders scored a touchdown on an eight-yard Collins throw to Jordan. Following a three-and-out possession by the Eagles, the Raiders again moved into scoring position, with the biggest play being a Collins pass to Moss for 22 yards. However, a 49-yard field goal attempt by Sebastian Janikowski hit the left upright and was unsuccessful. The teams traded punts, but the Eagles offense finally came alive as McNabb completed five consecutive passes, including 23 yards to WR Greg Lewis and 13 yards to Owens. But on a first down play at the Oakland 17, McNabb was intercepted by DT Warren Sapp to end the threat. The first quarter ended with the Raiders leading by 7-0. That was how it remained until midway through the second quarter when the Eagles, taking over at the Oakland 49 following a punt, drove to a touchdown on an 18-yard run by Brian Westbrook in six plays. With Akers unavailable, LB Mark Simoneau came in to attempt the extra point, but the low kick was blocked (it actually struck one of the Philadelphia linemen) and the visitors remained in front at 7-6. Following another Bartrum kickoff, the Raiders proceeded on a long 10-play drive that covered 51 yards. Janikowski was successful on a 28-yard field goal try with under a minute remaining in the half, and Oakland took a 10-6 lead into halftime. The Eagles put together an 11-play, 71-yard scoring drive to start the third quarter. 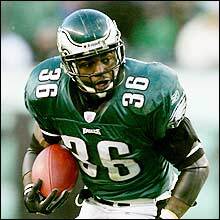 McNabb (pictured below), who had been clearly struggling with his injuries in the first half, was in rhythm as he completed seven short passes, including a four-yard touchdown pass to Owens. Capping things off was Akers successfully kicking the extra point and the Eagles were in front by 13-10. Later in the period Philadelphia put together another scoring possession. Starting deep in their own territory at the 10 yard line, the Eagles made a big play in a third-and-one situation as McNabb threw to Westbrook out of the backfield, who proceeded to gain 62 yards to the Oakland 19. Four plays later, McNabb connected with Westbrook again on a shovel pass for a five-yard TD and, with Akers again making the extra point, the Eagles stretched their lead to 20-10 heading into the fourth quarter. Oakland’s offense, which had struggled during the third quarter, came alive when, on the first play of the final period, Collins threw to Anderson for a 32-yard gain to the Philadelphia 16. The Eagles were able to keep the Raiders out of the end zone, however, and Janikowski kicked a 26-yard field goal to make it a seven-point game. It seemed as though Philadelphia might score again when McNabb threw to Westbrook for a 37-yard gain on the first play after the ensuing kickoff to move the ball into Oakland territory. But the Raiders got a break when TE L.J. Smith fumbled after catching a 17-yard pass. Safety Derrick Gibson recovered for Oakland at his own two and the Raiders proceeded to move the ball effectively down the field. Collins was successful on seven straight passes, with three of them to LaMont Jordan for 33 yards. But the drive stalled at the Philadelphia 19 and Janikowski was wide on a field goal attempt. The Eagles were forced to punt following a short series and the Raiders, taking over at their 35, again moved into scoring territory, this time converting key third downs along the way. In a third-and-15 situation, Collins threw to Moss for 31 yards to get into Eagles territory and, facing a third-and-10 play, he connected with Anderson for 17. A 27-yard pass to WR Doug Gabriel was good for a touchdown, and following the extra point, the game was tied at 20-20 with 2:17 showing on the clock. Taking over at his 20 following a touchback on the kickoff, McNabb completed back-to-back throws to Westbrook that totaled 30 yards to get to midfield. A 13-yard completion to Lewis converted a key third-and-nine situation. A 10-yard penalty backed the Eagles up, but McNabb went to Owens twice for 29 yards. After advancing to the five yard line, and with just 12 seconds left on the clock, Akers came out to attempt a 23-yard field goal. It was successful and he again fell to earth afterward, but there was celebration as Philadelphia came away with a 23-20 win. The Eagles outgained Oakland (365 yards to 344) and had more first downs (26 to 18). They also turned the ball over twice, as opposed to no turnovers suffered by the Raiders, but Oakland was penalized 13 times at a cost of 94 yards while Philadelphia was flagged on 9 occasions for 70 yards. In addition, while effective through the air, the Raiders had more rushing attempts (22) than yards (21). 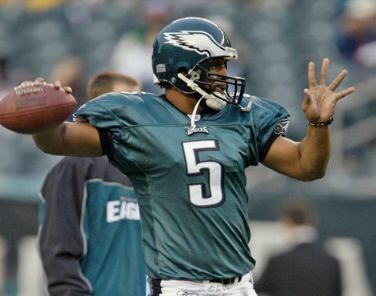 Donovan McNabb completed 30 of 52 passes for 365 yards and two touchdowns with one intercepted. Brian Westbrook (pictured at right) gained 68 yards on 13 carries that included a TD and also accumulated 140 yards on 6 pass receptions, including another score. Terrell Owens caught 9 passes for 80 yards and a TD. Most significantly, David Akers was able to kick two second half extra points and the game-winning field goal. For the Raiders, Kerry Collins was successful on 24 of 42 throws for 345 yards with two touchdowns and no interceptions. Courtney Anderson caught 5 passes for 100 yards and Randy Moss had 5 receptions for 86 yards. LaMont Jordan was stifled by the Eagles defense, gaining just 19 yards on 16 carries, but he also pulled in 5 passes for 53 yards and a TD. WR Jerry Porter had 5 catches as well, for 40 yards. Akers missed the next four games and Todd France filled in, connecting on six of seven field goal attempts and all five extra points. In 12 games, Akers was successful on 16 of 22 field goals and all 23 of his extra points. Akers remained with the Eagles for five more seasons and was selected to the Pro Bowl twice more before moving on to the 49ers and more record-breaking performances. The Eagles made it to 3-1 before faltering. Donovan McNabb was lost for the year after nine games and Terrell Owens was suspended after seven as injuries and controversy erupted. After reaching the NFC Championship game in the previous four seasons, and winning in ’04, Philadelphia sank to 6-10 and placed last in the NFC East. The Raiders failed to improve, ending up at the bottom of the AFC West with a 4-12 tally.